Happy New Year – and we start 2018 with a bit of a conundrum. It’s the Moon. It starts the new year at perigee; that is, it is at its closest to Earth. Then early on the 2nd, it is full (a bit like I have been for the last week!). Whether this closeness makes a difference to its appearance I will leave you to decide. As it takes just over 29 days to circle the Earth, it is full again on the 31st and in some circles this would be seen as a Blue Moon, although it will turn red for people on the other side of the world as it is eclipsed! Astronomers, being a serious lot, take a Blue Moon to mean the third full moon of a season which has four. That would still make this one a Blue Moon, except that astronomical winter runs from the Winter Solstice to the Vernal or Spring Equinox. So, there being no full moon in February, they have no Blue Moons this winter, making me glad I’m not an astronomer. What’s more, we get another one in March. Incidentally, the Earth also has an offset, elliptical orbit so its distance from the Sun varies throughout the year and in January it is at its nearest, or perihelion, at 05:30 on the 3rd – but it won’t make any difference. Now, where are all the bright planets? Well, they are all lined up to the right of the Sun, which means they are only visible in the mornings, a little before sunrise. It all starts at around six in the morning, which may be a little difficult on the 1st of the month! 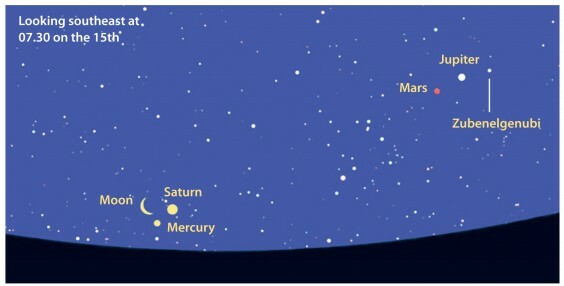 Low in the southeast, you can find Mars, Jupiter and the brightest star in Libra clustered tightly together. This star is nowhere near as bright as the two planets but I had to mention it because it’s the star with my favourite name, Zubenelgenubi! As the days pass, Mars, orbiting the Sun more quickly, will appear to move closer to Jupiter until the morning of the 7th when they are really close together or in conjunction. After that, Mars sinks lower in the sky each day. For the first few days of the month, you might just catch Mercury in the brightening sky lower down but it is usually tricky to spot. It, too, sinks lower each day and passes close to Saturn on the 13th. Being so much bigger, Saturn should be easier to find, especially during the second half of the month. Look for a thin crescent moon close by the pair of them on the 15th. “But what can we see in the evenings?” I hear you shout. Well, the 3rd sees the peak of the Quadrantid meteor shower, although that pesky Moon will be making the sky rather bright. Always worth looking though, especially a day or two after. Then we start to see the great constellations of winter. With their Nebulae and star forming regions and giant stars, we’ll have to come back to them next month!